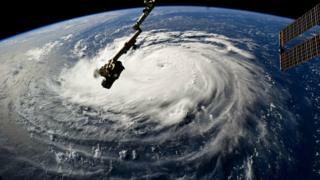 "Storm of a lifetime" hurricane Florence is predicted to bring deadly disaster to large parts of the eastern US coast when it makes landfall on Thursday. But as millions are under order to flee, some are being told they have to stay put. On Monday, South Carolina officials announced they would not remove inmates from at least two prisons inside mandatory evacuation zones. "In the past, it's been safer to leave them there," a spokesman for the South Carolina Department of Corrections said. One of those facilities is no longer in those zones but remains in Florence's path. In Virginia and and North Carolina, some prisons have already been evacuated. 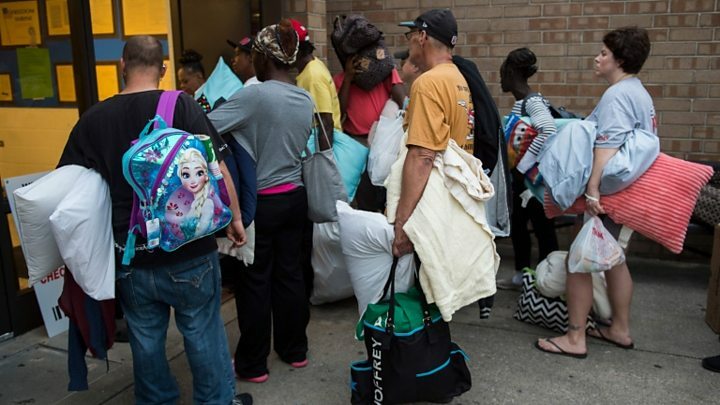 Many on social media are drawing parallels with the devastating hurricane Katrina, in 2005, when thousands of inmates endured terrible conditions in a facility that had not been evacuated. "Almost 1,000 inmates were left to die in Orleans Parish Prison during hurricane Katrina," said PhD student Bedour Alagraa in a widely shared tweet, which was also popular on Facebook. "The [prison officers] evacuated themselves and inmates spent five days in chest-high water, with no food or water. "The generator had blown leaving them in pitch blackness - 517 were never found." What did happen to inmates in Katrina? Hurricane Katrina was the third deadliest tropical cyclone on record to make landfall in the US, causing more than 2,000 deaths and catastrophic flooding and wind damage. New Orleans was particularly badly hit but prisoners locked in cells in the city's jail were not moved to another facility. A third of the inmates had been awaiting trial - not convicted of any crime. Power cuts and broken generators caused ventilation and lights to fail and electric cell doors to remain shut. One guard reported that officials had fled as the waters had risen. Prisoners were abandoned in cells without food or water for days as [toxic] floodwaters rose towards the ceiling, according to reports by the ACLU and Human Rights Watch based on more than 1000 eyewitness accounts. Orleans Parish Prison was eventually evacuated four days after the storm hit. Some inmates say they saw dead bodies and Human Rights Watch claimed that 517 prisoners had gone missing. In 2006, Sheriff Marlin Gusman maintained no prisoners had died and none had escaped. Later, it emerged that arrest warrants had been issued for 14 escaped inmates. Why are prisons not evacuated? South Carolina has not evacuated prisons in response to hurricanes since 1999, according to local media. A prison official told the Post and Courier last year: "In most cases, it is safer for the public, officers, and inmates for a facility to hold in place rather than transfer and hold in a secondary location." Evacuation can also be expensive and resource-intensive at a time when supplies are stretched or running out. Instead, extra staff can sometimes be deployed to manage conditions within the prison. "These aren't tiny facilities. It's an operation to get buses and make sure you have the staff there to transport offenders from one facility to another," a North Carolina prison communications officer told Vice News. During a prison evacuation in Puerto Rico, when hurricane Maria hit last year, 13 inmates escaped. Last year during hurricane Irma, 4,500 people were left in a correctional institution in Miami-Dade County, Florida. Guards later described cells covered in mould, urine and faeces, as well as leaking cells and power cuts during the storm. In Texas, four county jails were evacuated before hurricane Harvey made landfall last year. Built to withstand the most severe hurricanes, they were evacuated as a precaution and sustained some structural damage. But in Houston, which was severely flooded, inmates left in prisons and jails reported minimal drinking water and food and poor access to medicine, as well as stifling heat. In 1992, hurricane Andrew slammed Florida, causing huge damage to one prison in Miami, after which about 4,000 prisoners were moved out.